Tall Bearded Historic Iris "WHITE CITY "
"To me, the sight of a large clump-perhaps a dozen or eighteen spikes of 'WHITE CITY', standing up tall and straight with no hint of support, with cool, clean, perfectly distributed flowers, no frills, no fripperies, completely self-reliant, imperious and serene, is the highlight of any iris garden." 'WHITE CITY' A white heirloom iris flowering in New Zealand this season. I had found the iris growing outside an old villa in Greytown (A town not far from me) The buds before opening are a soft cool blue that open cool blue then turning white. Delicate ginger veining at the base of the hafts. Blooms have a habit of becoming more dog eared the older the bloom becomes. Bloom stalks are 40", wide branching and good bud count. Contrasting yellow blue/white tipped beard. Slight sweet perfume, Early to Mid season flowering. Foliage is a glaucous green clean wide leaf. An Historical iris with tailored elegant flowers. To me it is breathtaking in its simplicity,truly one of the finest heirloom irises in my entire collection and is greatly admired by all. Fertile, Sets seed readily, and has produced two large seed pod's after this year's flowering. Received an Award of Merit and Dykes Medal in 1940,and was highly praised both in England and in America. 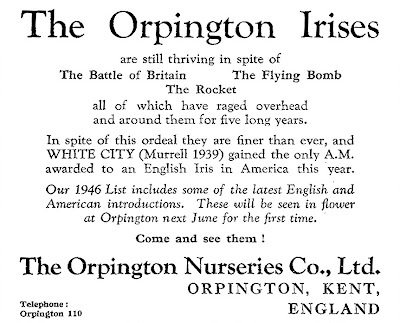 Raised by Mrs Olive Murrell the co-owner with her husband Major P. B. Murrell of Orpington Nurseries . Olive Murrell also raised many Irises over the years; among others MOOMBEAM, EVERLYN BENSON, SHOT SILK, HONOR STERNDALE, and CLEO. Acknowledged as an observant and reliable judge of irises who had a wonderful knowledge for parentage, colour-points and raisers of Irises. Widely renowned for her generosity, encouragement, and in introducing many new seedlings from new and up incoming hybridisers. Her links with New Zealand were strong and Introduced many of Jean Stevens varieties, DESTINY, RANGATIRA, INSPIRATION among others, also introduced NINA LEVETT, Raised by Miss.P.Levett of the township,Bulls, NZ. 'White City' was awarded the Dykes Medal in 1940 just three years after it was Registered in 1937, but it probably never received the international commercial success it truly deserved due to the Iris been released just prior to World War 2. During the war, Iris nurseries in England had their plants ploughed under and the land converted to growing food crops and it took many years after the War for the Iris Nurseries to re-establish themselves and to start hybridising at the pre-war level again. Hill Iris and Peony Farm, Lafontaine, Kansas 1946. Stevens Bros. Catalogue, Bastia Hill, Wanganui; New Zealand. Novelties 1947-48. WHITE CITY (Murrell 1939) E.M. 42"
Immense flowers of silken blue-white with a flush of plumbago-blue around the heart of its stiff stalwart bloom. Crisp finish and ice cold effect of the blooms is very striking. WHITE CITY (Murrell 1939)This superb white iris has more than justified the admiration it first created.The immense blooms are white with the faintest flush of plumbago blue when first opened. Sweetly scented. 4 ft.
An Appeal to British Hybridisers from New Zealand Charles A. Thomas BIS The Iris Year Book 1963. The writer of this note lives in New Zealand a country famed for its climate and strong winds which are the despair of all those iris growers who go for the modern varieties with their huge flowers and tall stalks which invariably require staking. A number of years ago the late Mrs Olive Murrell sent me a rhizome of WHITE CITY. This was a success from the start. It increased rapidly and grew strongly, but above all it stood up to the New Zealand weather. After one particularly bad storm an inspection of the beds showed that at least 80% of the tall irises were down and required staking whereas every stalk of WHITE CITY was erect and looking as if it was proud to be alive. One realises that WHITE CITY can no longer be classed as an up-to-date iris, but if some of its qualities could be injected into a number of the more recent introductions it would be all to the good. As a lover and grower of the Genus Iris for approximately 40 years may I in conclusion, appeal to British hybridisers to make 'conservative perfectionism' their watchword for the future. This smoothly shaped white flower is touched with a hint of blue. The standards are gently ruffled, and the flaring falls curl up around the edges. The white beards are brushed with yellow, and a few brown stripes emerge from the hafts. Each flower is perfectly balanced against the other. WHITE CITY (Murrell 1939) TB- M-WW Orp. 1939 R.1937 (Pagent X Pervaneh), Silver Medal I.S 1937 AIS AM 1945, British Dykes Medal 1940 Many thanks to the British Iris Society Yearbooks (my collection from 1924 No1 to 2009) and their detailed Articles and observations that make the ID of British Irises just that much easier and a massive hat tip to Sarah Cook and Phil Edinger for the interaction of thoughts and discussion's concerning the above. A year or so ago an iris listed as WHITE CITY was sold on Trade Me in New Zealand although it has a white colouration this was the only thing it had in common with its namesake. Makes one wonder who purchased this impostor (obviously not someone who has any knowledge of Historic Irises) and will the iris wrongly labeled as WC be past on or traded with the name, only to spread and increase an Iris with a contentious name. Sometimes to ID irises is a lot like beating a dead snake. "I am completely gaga for White City. It was the first iris here, (now they are 1500, +5000sdlgs...!) and it has survived in the mixed borders, surrounded by so many plants, it's rhizomes most of the time in the shade, and it still thrive! When i see the problems i have just to barely keep alive most of the new frilly beauties, in specially raised beds, with drainage,no competition, no shade, really, i wish they were more like White City! I never have enough of it, especially in the evening, it glows ! Tall Bearded Iris "OLD BLACK MAGIC "
Tall Bearded Iris "IMPRIMIS "